AFTER is a disaster training program for high schoolers, disguised as an AR (Augmented Reality) app and game. Through playing the game, teens in Red Hook (the most highly-impacted NYC neighborhood after Hurricane Sandy) learn where to go for help, and where to find relevant resources in their neighborhood in case of natural disaster. The game was designed by second-year students Benjamin Bartlett, Yangying Ye, John Boran Jr., Phuong Anh Nguyen & Gustav Dyrhauge. 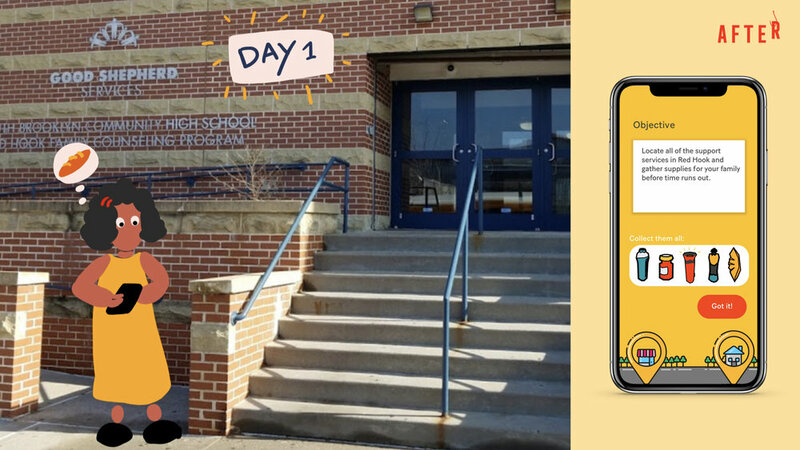 AFTER uses AR to make disaster relief training fun for high schoolers, turning them into potential guides for their community in case of an emergency situation. In addition to empowering them with knowledge of their surroundings—knowledge they acquire through game play—AFTER turns them into potential guides for others in their community during a stressful emergency situation. The group drew a lot of inspiration from Pokémon GO, the AR location-based treasure hunt app, which was already widely enjoyed by their target audience. “Pokémon GO had already figured out a lot for us in terms of usability. We really played off of the game’s frameworks in order to give our own app a shortcut to working easily and resonating with our users,” the team shared. Through employing four different software platforms to create the game (from developing the back end with Unity and working with MapBox, to prototyping with Torch AR and InVision), the team gained valuable insights in building for immersive experience.